This is the category for all non-article pages such as staff, submission guidelines, advertising guidelines, Core Vision statement, jobs and internships, etc. What Is a Tikkunish article? *It in some way brings a compassionate frame to a complex issue, reflecting empathy, or psychological complexity, or a spiritual dimension, which raises new ways of thinking about issues that are currently being discussed or ought to be discussed. This quarterly issue of the magazine is available both online and in hard copy. The full online articles are only available to subscribers and NSP members — subscribe or join now to read the rest! You can also buy a paper copy of this single print issue. Members and subscribers get online access to the magazine. If you are a member or subscriber who needs guidance on how to register, email miriam@tikkun.org or call 510-644-1200 for help — registration is easy and you only have to do it once. If you appreciated these free web-only articles, please help enable us to keep up this important work by becoming a print subscriber or offering a donation. This is a deeply insightful analysis of how self-destructive and dangerous to all humanity U.S. responses to and engagements with terrorism have been. For many decades, Ron Hirschbein has been an intellectual architect of Concerned Philosophers for Peace. He asserts that the U.S. campaign against terrorism has helped produce the very violent world it was supposed to prevent. Terrorism is most widely understood as the intended infliction of violence upon noncombatants or civilians, so it is ironic that most of the Western media fail to notice that the United States and its allies have been engaged in terrorism since World War II, despite sanctimoniously condemning the terrorist actions of others. Hirschbein gives us an alternative history of the past seventy years. 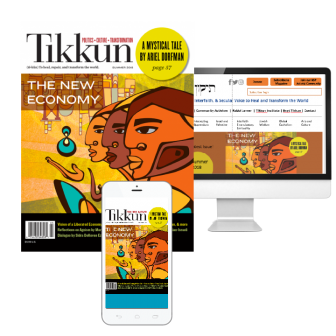 Tikkun is the winner of the prestigious 2014 “Magazine of the Year: Overall Excellence in Religion Coverage” award from the Religion Newswriters Association! Managing Editor Alana Yu-lan Price accepts the RNA award on behalf of Tikkun. Credit: Dawn Cherie Araujo. Tikkun caught the eye of the Religion Newswriters Association (RNA) with our special issue on immigration, which took discussions of spiritual religious principles and values beyond the confines of temples, churches, mosques, and synagogues, and instead debated their application in political and social realms. Reading Puck Lo’s report on a Sikh temple that mobilized to protect a worshiper from deportation, a diverse array of articles on why scripture should energize faith communities to fight for more caring policies on immigration, Ross Hyman’s impassioned article about why it’s a Jewish obligation to stand up for collective bargaining rights, and the many other wonderful contributions to that issue, the judges at the RNA decided to offer this special honor to Tikkun. 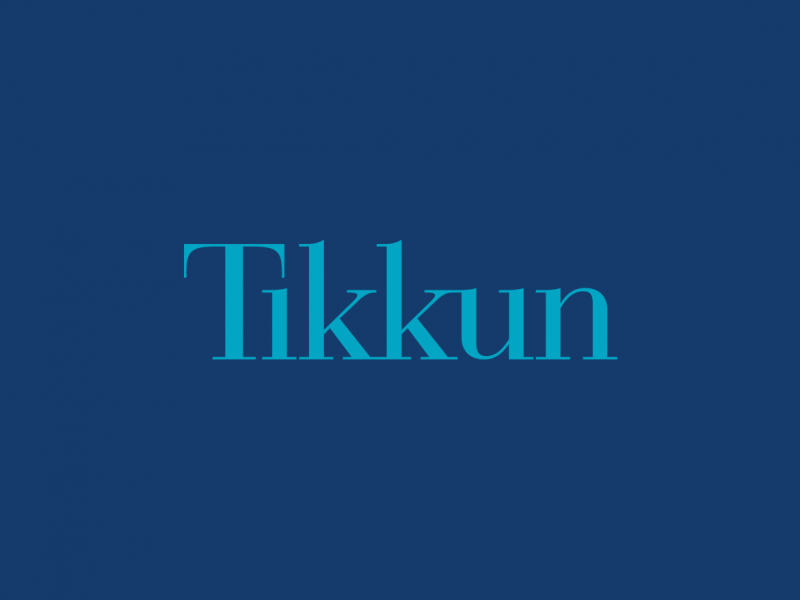 The immigration issue lauded by the RNA was just one example of the deep convergence of religious and political thought that makes Tikkun powerful and unique. book, no guide. They need no ancient tongue or prophecies. Adapted from the Hebrew by the author with Lisa Katz. Translator Lisa Katz is editor of the Israeli pages of the Rotterdam-based Poetry International Web. One of the popular ways to dismiss plans for healing and transforming the world is to assert that the distortions we see in the contemporary world are an inevitable outcome of a fixed human nature. In his careful examination of Jewish thought, Alan Mittleman insists on the centrality of moral personhood not constrained by any set of conditions external to the process of ethical reflection and intuition. Not only are reductionist programs incoherent, he argues, they are also absurd. He argues for real freedom and transcendence but simultaneously insists on our human limitations: “We are holy—and capable of unimaginable evil.” Holding both, he suggests, is one of the great strengths of the Jewish tradition. Some genetic diseases are more prevalent among Ashkenazic Jews than among the general population, largely because Jews were always a small population and historically predominantly married only other Jews. Nobody Home presents three interviews conducted by South African scholar and writer Julia Martin with the poet Gary Snyder that take place from the late 1980s to 2010, along with a selection of letters between them covering the same period. Martin was a young academic in apartheid South Africa when she first reached out to Snyder, motivated by her critical work on his poetry and thinking. Martin’s study and practice of Buddhism and her intuitive grasp of Snyder’s importance as a forefather of a growing international movement of spiritual environmentalism provoked Snyder to respond with sympathy and encouragement. They had an instant rapport in letters, which led to the interviews. This is a great period for Snyder, as his thinking about the nondualism of self/no-self and its relation to the world and all phenomena is culminating in his concentration on finishing Mountains and Rivers Without End, one of the crowning works of his generation of poets. This quarterly issue of the magazine is available both online and in hard copy. Everyone can read the first few paragraphs of each piece, but the full articles are only available to subscribers and NSP members — subscribe or join now to read the rest! You can also buy a paper copy of this single print issue. We sent an email and postcard to all current members and subscribers explaining how to register for our members-only area. If you remember the username and password you created for Tikkun, you’re all set. I used to believe are false. Letters from Mika Dashman and Glen T. Martin. If you appreciate these free web-only articles, please help us continue publishing important work by becoming a print subscriber or offering a donation. Adam Morris is managing editor of Tikkun. He has contributed work to numerous literary and cultural publications. In this short, rich book of prose poems, Clive Wilmer renews the pastoral tradition by eschewing romantic idealizations and coming into contact with the living image of an Eden corrupted by natural processes. Those processes, which connect us to the mystery of life and spirit, include both the workings of memory and the mechanisms of civilization. Wilmer’s memories are of a midcentury South London childhood “injured by enemy bombs”; of wooded commons where trees were “the very image of freedom in community”; of discoveries of Shakespeare’s power and Louis Armstrong’s musical “good place, where the leopard lies down with the kid”; and of art as “the expression of man’s pleasure in labour.” These memories form a groundwork for his warmly drawn and enigmatic human portraits, which enliven a religious vision that is convincing for its glowing clarity and sense of scale. Also recommended: Wilmer’s New and Collected Poems (Carcanet, 2012). To view Tikkun Recommends as a PDF, click here.